Detective Alex Morrow discovers that the darkest secrets never stay buried as she investigates the criminal underbelly of a seemingly tranquil seaside town.For reasons she can't quite explain, Alex Morrow is addicted to watching surveillance footage of Roxanna Fuentecilla--a gorgeous Spanish mother of two, in a tempestuous relationship with her boyfriend, who recently relocated to Glasgow under mysterious circumstances. She is also Morrow's prime suspect in an investigation that resembles a soap opera, filled with glamorous jetsetters and enough money to interest the highest levels of law enforcement. Until Roxanna vanishes. Morrow traces Roxanna's steps to Helensburgh, a sleepy, picturesque seaside community. But behind the idyllic Victorian homes and quaint storefronts, darkness lurks. Home to a man with blood on his hands who is haunted by guilt, a mysterious woman with ulterior motives back in town for the first time in decades, a sexually frustrated restaurateur looking to blow off steam, and a crew of vicious small-time gangsters blindly following orders, it's a town ruled by base instincts where no one is quite what they seem. And it's the perfect place to get rid of someone. When she uncovers an unsettling connection to Roxanna's job back in Glasgow, Morrow suspects that her missing person is more than a white-collar criminal on the lam--she may also be a victim caught up in a sophisticated conspiracy that stretches far beyond Helensburgh and is more personal than Morrow ever imagined. As the truth rises to the surface and the conflicts that lie beneath Helensburgh's calm waters threaten to explode, Morrow must find Roxanna before any hope of solving the case disappears with her. 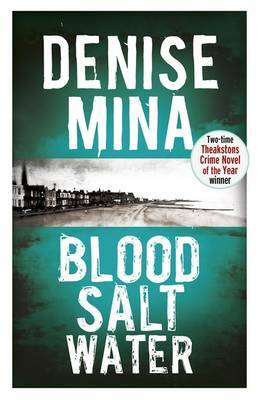 A gripping tale of greed, power, and vengeance, Blood, Salt, Water is a masterful crime novel from Denise Mina that confirms her reputation as "e;one of the genre's brights stars"e; (George Pelecanos).